Have you often wondered whether logical reasoning skills are restricted to puzzles that only use numbers? 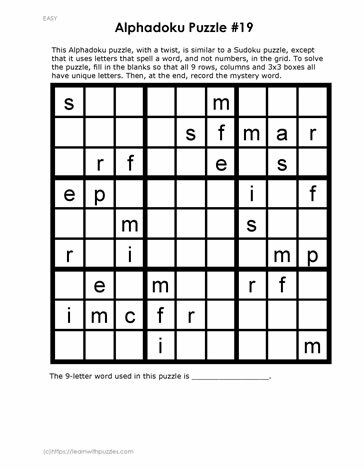 Puzzles such as Alphadoku puzzles use letters instead of the regular numbers 1-9. This Alphadoku puzzle uses letters from a unique nine-letter word and is input into the grid. Puzzle solvers must apply basic Sudoku rules in order to solve the brain teaser. 1. Each letter can occur only once in a column. 2. Each letter can occur only once in a row. 3. Each letter can appear only once in the three-by-three grid. Solve the puzzle and discover the unique nine letter word. Record the word at the bottom of the page.